Trade show statistics reveal a steady rise in attendance. Best of all news is that attendees are there to do business; 82% have the power to recommend, specify, or make final purchasing decisions. 49% are there with the intention to purchase at the show. According to the Center for Exhibition Industry Research’s September 2016 Industry Outlook Conference, exhibitors want to zero in on customer profiles and place the emphasis on tracking visitor behavior. 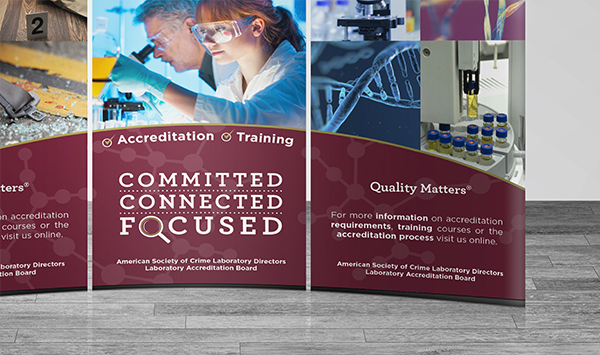 ASCLD accreditation programs for public and private crime laboratories had a strong message to get across at trade conferences, “Quality Matters”. 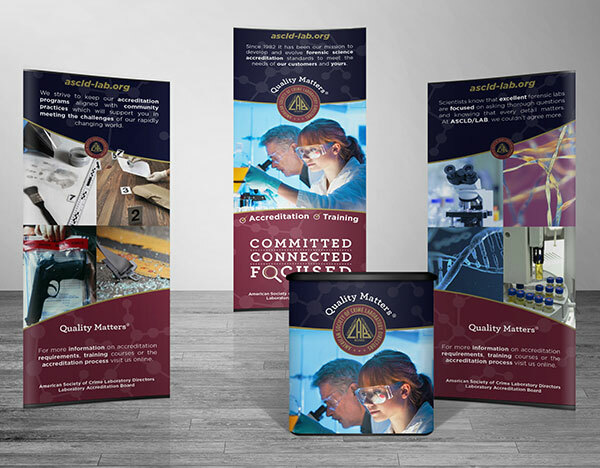 They asked us to create a fresh new event display and supporting communications (advertising/brochure). After evaluating their annual exhibit spaces, they requested a solution that was portable/flexible. They needed a design that delivered big impact and could be adapted to multiple event spaces. With space sometimes an issue—we focused on creating a large display that could be split into sections with each one working independently. Six Half Dozen created an ensemble of panels that would work individually or together to engage audiences in a powerful way. 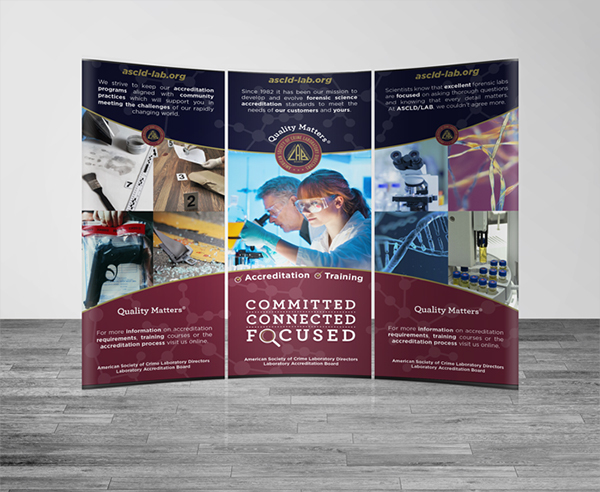 Taking the three-panel approach, we were able to create an affordable exhibit that works at the very different exhibit spaces that ASCLD attends. 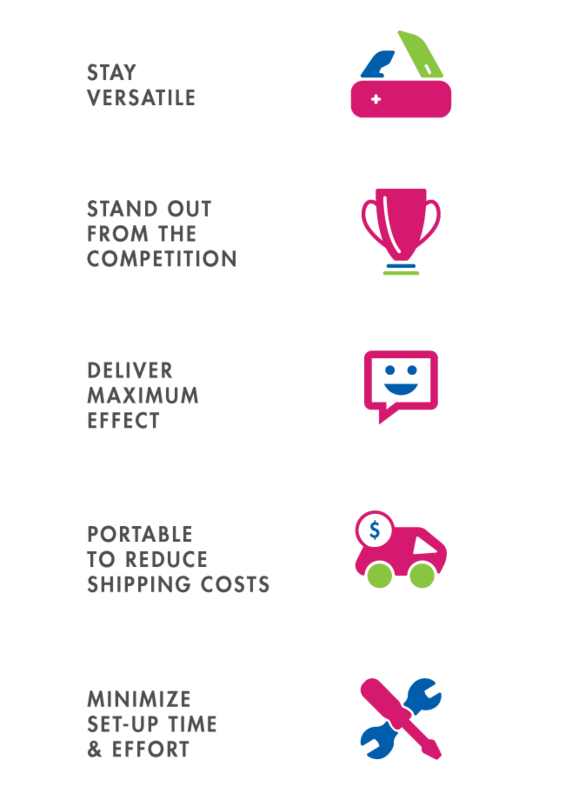 Transportation/shipping costs were significantly reduced at the same time. The compact nature of the individual banners also facilitated handling and transporting. Curved elements add depth to our design—focusing on how they would work together. A center panel features their main call to action and messaging— two other panels communicate additional information. The three panels can be arranged at different angles to create depth, direct traffic through the exhibit space, or as a triptych. The new design has compelling visuals – clear and clean messaging. The result – ASCLD noticed more traffic to their booths when they had the new booth design. The information effectively communicates key points—pulling in the traffic, engaging visitors and providing a platform for discussion and interaction with prospective clients.